Christian Hütter Searches for His American Dream. 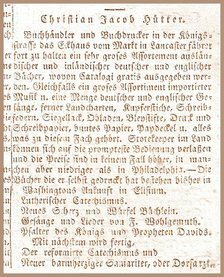 The immigrant Moravian printer Christian Jacob Hütter did not have an easy life. Although he was a very good printer, in 1803 his Lancaster print shop failed here with flying colors. Hütter's personal life was even more painful. His twin sons died two months apart at age 23 and 24. And his first two wives died too young. Please Buy Hütter's 8,000 Books. He Needs the Cash. Competition was stiff, here in Lancaster, for an immigrant Moravian printer in the early 1800s. Christian Jacob Hütter had come here from Neudietendorf, Germany, in search of the American dream. But unfortunately for Hütter, another Moravian printer named Johann Albrecht was already well established here as king of the print-shop roost. There simply was no room here for one more printer. 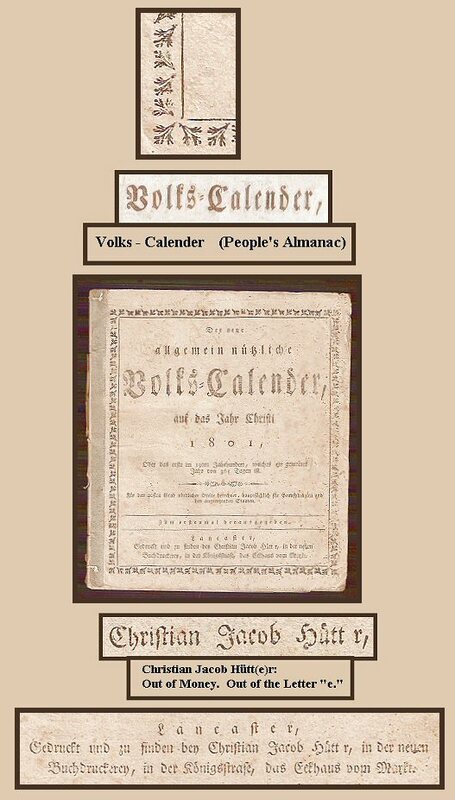 Hütter's print shop was at West King Street and Market Street, where he also printed his almanac: the Volks Calender (The People's Almanac.) Unfortunately, most Volks did not buy Hütter's books, newspapers, or almanacs. Despite his excellent advertisements. 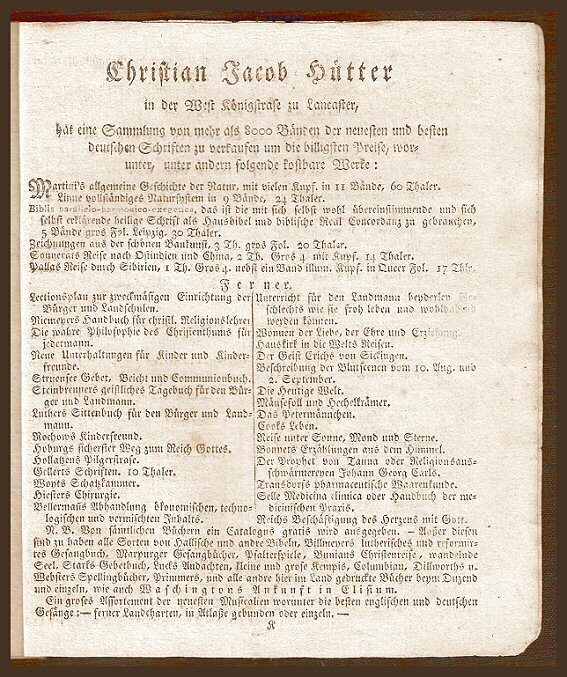 In his 1801 almanac Hütter advertised 8,000 volumes of books for sale. (Sounds like unsold inventory.) One year later he even advertised his business in the 1802 almanac printed by his competitor Solomon Mäyer in nearby York. To no avail. By 1803, Hütter's printing business and newspaper The Lancaster Correspondent, had lost $5,000. But Hütter was no quitter. He moved his business to nearby Easton, where he found the success he had hoped for here in Lancaster. He beat the odds, beat his bankruptcy, and found his well-deserved American dream. 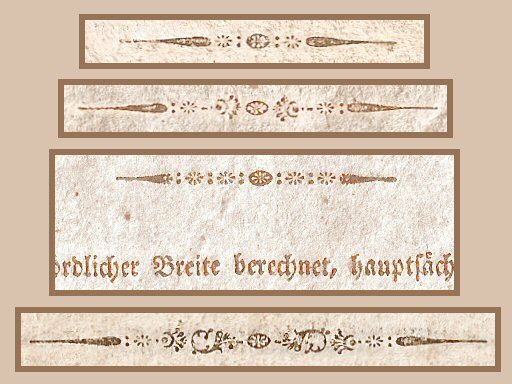 Above (Click to Enlarge) This is Hütter's advertisement for his printing business. The ad is in an 1802 almanac printed in nearby York by Solomon Mäyer. This 1802 almanac is rare; I have not found any other references to it. Above: In December 1799, George Washington died of pneumonia at his home in Mount Vernon. His last words were, "Tis Well." 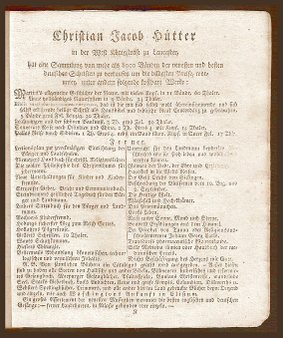 Shortly after, the immigrant printer Christian Jacob Hütter printed this 16-page memorial to his adopted country's first president. This eulogy is a two-scene dialog set in the afterlife, where George Washingtion is greeted by historical figures already there, including Christopher Columbus, William Penn, and Ben Franklin. Also included are songs celebrating American freedom or Freiheit, songs titled Americanisches Freiheitslied and Lob der Freiheit. This rather rare pamphlet is almost never seen; I have located it only one other library, The Library of Congress. For me, this little book is a memorial for Washington and Hütter, both. Above: Christian Jacob Hütter jazzed up his Lancaster books and almanacs with these printers' ornaments. You have to look hard to find them. They're hidden in the text, but they're in there. In these plain, brown books, I'll take all the ornaments I can get. They keep my eyes from glazing over while I'm trying to figure out the text.